NY Bagel Café Franchise Scam? NYB CEO Joe Smith and franchise salesman Dennis Mason took her $25,000 franchise fee as a refundable downpayment, a Massachusett’s woman claims, then refused to give it back when she was unable to get funding. With litigation being cost prohibitive, she is taking to the Internet to warn others about the NY Bagel Café franchise, Joe Smith and Dennis Mason. (UnhappyFranchisee.Com) In 2009, the Conlons dreamed of opening a sandwich shop. According to Janet Conlon, she filled out an application for a NY Bagel Café & Deli franchise and was told she had excellent credit and qualified to be a franchisee. She was told that she needed to pay the $25,000 franchise fee up front and would be connected with funding sources. The Conlons weren’t able to procure funding. CEO Joe Smith (who sometimes goes by Joe Bagels online) has refused to refund the $25,000. Six years after New York Bagel Café took her $25,000, a Twitter battle broke out between Conlon and Joseph Smith. Smith was referring to the supposed re-opening of the River Vale, NJ location, one of many failed New York Bagel franchises (See NY BAGEL CAFÉ Franchise: How Many Have Closed? [UPDATED]). New York Bagel Café & Deli deleted the exchange. Joe Bagels claims the franchise fee was non-refundable. However, an email exchange between Janet’s son Eric and New York Bagel franchise salesman Dennis Mason (also read DENNIS MASON Franchise Complaints ) provided to UnhappyFranchisee seems to validate Conlon’s claim. The emails are dated 7/13/09, while Dennis Mason was still trying to close the sale and the Conlons were deciding whether to move forward. Are Joe Smith, Dennis Mason & New York Bagel Harvesting Franchise Fees for Profit? Are Joe Smith, Dennis Mason & New York Bagel Café collecting franchise fees as a profit center, knowing that the franchise stores will never open? It’s hard to know how many franchise fees New York Bagel Café is collecting each year, since Joe Smith has refused to provide us with his Franchise Disclosure Document (FDD) in which franchisor’s are required to state how many franchises have been sold but not yet opened (SNOs). The New York Bagel Café disclosure documents we have seen do not include the required information in Item 20 regarding SNOs or the number of franchises that have closed in the previous three years. Have You Paid New York Bagel Café a Franchise Fee? 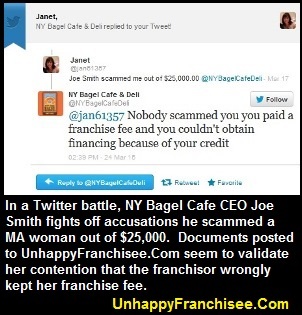 If you have paid New York Bagel Café, Joe Smith or Dennis Mason (who also goes by the name “Keith” or “Ken”) a franchise fee, please email us in confidence at UnhappyFranchisee [at] Gmail.Com. We would like to hear your story – positive or negative. These guys are trying to steal my hard earned money right now via email. I have records as of last week that my $25,000 franchise fee is fully refundable if I am unable to obtain financing even though they say I am fully approved for up to $150,000. The testimony statesd in this article from this victim whom is speaking out is very accurate to what I am experiencing. Dennis Mason and his stories apparently are very misleading. However, It would be a nightmare for him if he where to defraud me out of 25k . That money is gone and you won’t find these guys. Not shocked they’re still at it I guess this Is a career. don,t want to give my money back. i heve all the documents i can send to you.